Low profile hydraulic jacks with a compact design for use within low height spaces, all jacks are manufactured from high strength steel. The hard chrome plated plungers combined with polyurethane ram wipers help prevent scratching or corrosion and extend the life of the low profile hydraulic jack. We offer six different standard models of low profile units ranging from 10 to 145 tons in capacity. All our low profile hydraulic cylinders are fitted with end-stop glands to avoid accidental over-stroking occurring and provide additional piston guidance increasing the lateral restraint capacity of the low profile hydraulic jack. 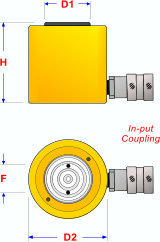 Female quick release couplings and special retraction springs for easy plunger return come as standard. Due to their weight the LP90 and LP145 models are fitted with a lifting handle. The low profile hydraulic cylinder body has two mounting holes which enables fixing to machinery such as, fixtures, clamping jigs, spreader plates, etc., the plungers load contact area is also grooved to increase its horizontal grip, we recommend that you use a thin plywood packer between the plunger and load contact area. These units should only be operated between parallel surfaces, if this is not the case then use a steel tapered shim which must cover the full plunger area or install and level a steel plate bedded on a high strength mortar or grout. Hydra-Capsule Limited continuously increase our stock of equipment to meet customers requirements, special types with different load or stroke capacities can be easily designed and manufactured to suit your particular application, please contact us for further details.